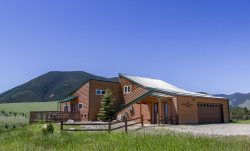 Mountain cabin charm with an in town location, the Brown Bear Lodge is a rustic log cabin located in Buetner Park in Red Lodge. This historic area housed WPA workers in the 1930’s as they built the Beartooth Pass, America’s Scenic Byway. The combination of old time charm with the conveniences of town makes Brown Bear Lodge a true western experience. Equipped with an indoor hot tub, it’s the perfect place to unwind after skiing, hiking, biking, shopping or doing any of the multiple activities found in Red Lodge. Brown Bear Lodge sleeps up to 12 people with 2 bedrooms, and 2 fold down futons in the living room. One bedroom has a queen bed and a double, the other bedroom has two double beds, then there is two double futons in the living room. One block from Broadway Ave.